March Madness? How about just something fun to do this month? Here’s what’s happening in the Savannah area this March, 20176. For gamers and comic book enthusiasts, GnomeCon is coming to the Coastal Georgia Center at 305 Fahm Street. This science fiction and fantasy convention is March 2-4 with a variety of events and activities for people of all ages. Participate in costume making workshops, game tournaments, zombie family feud and a unique screening of the Rocky Horror Picture Show. Tickets start at $35. River Street’s St. Patrick’s Day Celebration is happening on March 17 at the Riverfront Plaza and includes entertainment, life music, outdoor restaurants, singing and celebrating. Of course you want to wear green this day to participate in some of the fun activities, contests and Savannah Waterfront Association’s largest event of the year. If you bring your ID you can grab a wristband to enjoy your adult drink to go walking around one of Savannah’s largest parties. Wristbands are $5 per day and can be purchased at multiple downtown locations. You won’t want to miss this annual event March 17, 18th and 19th. On March 11 is the Greening of the Forsyth Fountain. This traditional event dyes all the fountains green in Savannah starting off the St. Patrick’s Day tradition. However, they do need a lot of help so you want to get involved with the city and their events tours to participate in this fun event. The weekend of St. Patrick’s day is the Tara Feis Irish Celebration sponsored by the city’s Cultural Affairs. This is on the Saturday before the St. Patrick’s Day parade and is a family-friendly festival open to the public with free admission. It offers live Irish dancing performances, food, activities, arts and crafts and games. It’s held each year in Emmet Park in the heart of downtown Savannah beginning at 11:00 AM. On the second or third weekend of the month is the Celtic Cross Ceremony and Recession where Irish Catholics join together to celebrate their heritage at Emmet Park. Bagpipes play, Irish speakers talk about the past and the future of Irish Catholics in the Savannah area and there’s a reception at 2:30 PM with food and refreshments. The event starts at 1:00 PM. If you’d like to experience Savannah in a new way, check out these must-try places in and around the area. Runner up for the 2015 Foodie Awards, this amazing brunch is something you won’t want to miss located at Tybee Island social club, 1311 Butler Ave. Enjoy delicious smoked salmon, creamy shrimp and grits, their famous: glazed ham Monte Cristo, fried chicken biscuits and blackened fish taco. This is just a small taste of the many yummy things to experience at Bluegrass Brunch. Lunch at the Grey This Foodie Award winner for best new restaurant features an amazing lunch for an unbeatable price. This $7 dish served every Saturday afternoon until 3:30 PM features a unique and distinctive taste and whatever the chef decides on for the day. Located at 109 Martin Luther King Jr. Boulevard, this diner inspired restaurant is open Tuesday through Sunday but you wanted make sure you make reservations for the $7 lunch on Saturday afternoons. The Wyld Dock Bar If you’re looking for something on the “wyld” side you have to check out this restaurant. With a unique menu like quail sausage, rabbit and Ginger Seabass, you’re bound to try something you’ve never had before. This place is located at 2740 Livingston Ave. They have great seafood, burgers and amazing sangria. Rocks on the Roof If you’ve been searching for the best margarita in the city, look no further; we have found it at Rocks on the Roof at 102 West Bay St. Their blood orange margarita will blow everything else you’ve ever tried out of the water. Of course, there’s multiple other options to try but it’s a great location on the top floor of the Bohemian Hotel to just sit back, relax and take in the view. B’s Cracklin’ BBQ Located at 57 Coffee Bluff Villa Road, this unique restaurant was recently featured in Garden and Gun magazine. With delicious barbecue, luscious sides and creamy sauces, there’s something for everyone at this fantastic barbecue joint. They serve only locally grown meats and vegetables, so whether you’re having the rib plate, chopped chicken sandwich or crackling cornbread, you know that it’s local and you know it’s going to be good. Stay tuned to our website for more information, events, neighborhood details and all the latest on the Savannah real estate market. At Hull Park is the annual community Spring Carnival. This is located at 504 E. 54th St. Families and children alike will enjoy Easter egg hunts, games, prizes, clowns and more. This is sponsored by the New Covenant Church. At Stockade Storage located at 1060 King George Blvd., kids can get a picture with the Easter Bunny at this annual Easter egg hunt event. At the Habersham YMCA, and join us for a Good Friday breakfast with Pastor Andy Blair of Tapestry Savannah. This is a free event starting at 7:15 AM located at 6400 Habersham St.
At the New Beginnings Community Church in Richmond Hill Georgia there will be Easter egg counts for toddlers, infants and children of all ages. The Easter Bunny is even said to make an appearance. Provisions will be made if there is bad weather and this is free admission including children’s crafts, music and storytelling. Make sure you bring a basket to collect your eggs. In Pooler Georgia at 900 South Rogers St. is the free community egg hunt sponsored by Chick-fil-A and First Presbyterian Church. The egg hunt is free but you must register first at firstprespooler.com/egg_hunt in order to be eligible. There will be two fields for kids and one for children ages five and under and the other for children ages six through fifth grade. The River Street Arts Festival is also happening the weekend of Easter, April 3 and fourth from 4 o’clock until 10:00 PM on Saturday and from 10:00 AM until 10:00 PM at River Street on Saturday. This is a festival for the visual arts. If you’re looking for something other than an Easter egg hunt, you might check out these beautiful interactive activities for families and kids. There will be community performances, live music and delicious food. On April 5 is the Visual Blues Art Exhibit at the Jepson. This comprises 52 paintings, drawings and other types of artistic mediums illustrating the unprecedented outburst of artistic creativity during the Harlem Renaissance. This inspired blues, jazz, dance and social clubs. This is located at the Telfair Museum. I hope you have a safe, healthy and happy Easter weekend; I’m here whenever you need help with real estate sales or purchases in Chatham and Bryan County Georgia. Spring break doesn’t have to be party central for every family. Some families are looking to go away with their small children and find unique and interesting events, activities, sights and sounds during their spring break or maybe even just staying home and finding different things to do right here. Spring break for the Savannah school district is April 6 through the 10th and if you plan on staying close to home this spring break here are some of the events happening around the Savannah area. Spring Break Art Camp – This event is held every day of the week and is perfect for families that simply must continue to work but need a comfortable and safe environment for their children. This event is Monday through Friday from 9:00 AM until 5:00 PM and if you’re a city resident of the fee is just $140 per child per session. Make sure your child has a lunch with them and let them have a great day at Spring Break Art Camp making fun crafts that they can bring home and display. Cruises – Now might be the perfect opportunity to take that river cruise you’ve always wanted to enjoy. You can schedule cruises for lunch or dinner and there are special discounts and information on Spring Break cruises. Savannah Foodie Tour – Are you a foodie? Then you can’t miss the Savannah Food Tour. This is a great way to explore local culture and cuisine as you ride along in a comfortable motor court making your way through historic Savannah learning about the history and interesting dining options available. The tour just opened for the 2015 schedule so make reservations early. Best Nightlife – If you are looking for a party, there will be several special events, bar and nightclub parties throughout Savannah Georgia. Each will have their own specials, music and events running all week long so if you have a favorite in mind simply check their website or visit the 912area.com or information on spring break schedules. Theater! – At the Historic Savannah Theatre you can enjoy a variety of different musicals and theatrical performances. Shows include Viva Vegas!, I Love You, You’re Perfect, Now Change!, The 25Th Annual Putnam County Spelling Bee, Broadway On Bull Street, and Savannah Live! Visit the website for times, tickets and scheduling your theater show. Camping – Of course this is a perfect time to head out to Tybee Island and enjoy some quality beach time. You can rent a cabin, and RV spots or stay in one of the hotels on Tybee Island. This might be a great “staycation” for your family to learn more about your own area. If you’re considering buying or selling a home during spring break, I would be happy to offer personalized tours of any properties for sale, local information on school districts and the communities or offer a customized list of homes that meet your search criteria and price throughout the Savannah Georgia real estate market. Follow the Rainbow to Savannah, Georgia this St. Patrick’s Day. You won’t find any pots of gold but you will find some amazing activities for you, your family, and your friends. Savannah’s St. Patrick’s Day Parade: On March 17th starting at 10:15 AM and going to about 2:30 PM the Saint Patrick’s Day Parade will be occupying the streets of Savannah. This parade-second largest in the U.S- will entertain visitors to the local Celtic and Irish families, pipe bands, and traditional Irish dancers. For the 191st year of the parades running, 15,000 people will take part in the parade along with 350 different floats and other marching units. The parade will be starting out on Gwinnett and Abercorn streets and will end in Madison square (for the complete parade route check out the first link). St. Patrick’s Day Festival: From Saturday March 14th to March 17th, a festival will be taking place on River Street and City Market. This festival will be fun for just about everyone with lots of food, live bands and other entertainment, face painters, and caricature artists. And for those 21 and older Corona, Sweetwater, and Heineken will have their own tents for the festival. If you want to take part in the drinking you will need to purchase a wristband that symbols that you are OK to have your drink in hand. Wristbands are $5 and can be purchased at any of the booths. Tara Feis: On Saturday March 14th from 11 AM to 5 PM Tara Feis will be taking place in Emmet Park. If you and your family are looking for some clean fun that is alcohol free this is the event for you. There will be different forms of entertainment for all ages, from the puppeteers and magicians for the kiddies to Irish dancers and the Irish band FullSet for the adults. But that’s not all; there are tons of arts and crafts for the little ones including potato printing and castle making with sugar cubes. When lunch time hits make sure to stop by any one of the food tents, and if you want to have the kids burn off any extra energy before taking them home (which is always nice) there are bounce houses and games set up around the park. 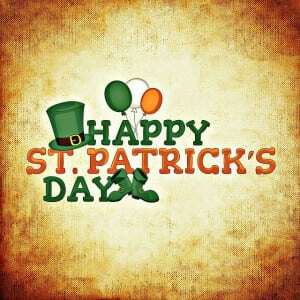 Hope everyone has a great St. Patty’s Day! And if you do choose to drink, please drink responsibly.